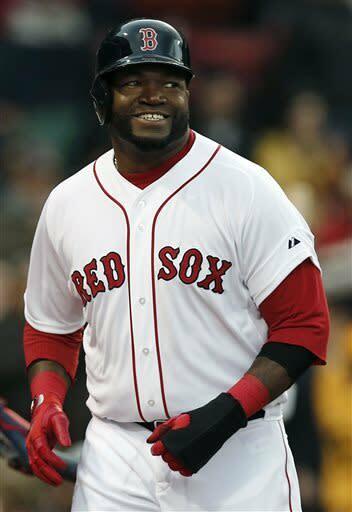 BOSTON (AP) -- Mike Napoli tried to downplay the question about playing in Fenway Park. Nope. He couldn't help himself. Napoli hit a grand slam and drove in five runs, Will Middlebrooks busted out of a slump with a three-run homer and the Boston Red Sox rebounded from a doubleheader sweep by beating the Oakland Athletics 9-6 on Monday night. Napoli's playing time was limited but the results were excellent in Fenway as a visiting player. In 19 career games, he hit .306 with seven homers and 17 RBIs. Signed as a free agent during the offseason because of his propensity to pull the ball for power with Fenway's Green Monster, Napoli is off to a great start, collecting 25 RBIs and four homers in 19 games. The Red Sox, swept by Kansas City in a split-doubleheader Sunday, scored three runs in the fourth and five in the fifth. Napoli's fourth career slam keyed the five-run fifth and helped end Oakland's eight-game winning streak against Boston. The Athletics dropped their season-high fourth straight after being swept in a three-game series at the Tampa Bay Rays over the weekend. Oakland's winning streak against Boston was its longest in franchise history since the Philadelphia Athletics won eight in row in 1932. Felix Doubront (2-0) struggled with his control, but got the win on a night with wind chills in the 30s. He allowed three runs on three hits, walking five. He also threw two wild pitches and struck out eight in 6 2-3 innings. A.J. Griffin (2-1) was tagged for a career-worst nine runs - seven earned - and eight hits in four-plus innings. Oakland manager Bob Melvin felt as if the young right-hander was just missing up in the strike zone. Dustin Pedroia went 0 for 5, ending his streak of reaching base safely in each of Boston's first 18 games. Trailing 2-1 in the fourth, the Red Sox jumped in front when the slumping Middlebrooks belted his homer. Napoli was hit by a pitch and Daniel Nava doubled down the left field line before Middlebrooks, just 4 for his last 43 since hitting three homers in Toronto on April 7, homered into the Green Monster seats. Chris Young's sacrifice fly cut it to 4-3 in the fifth, but the Athletics left the bases loaded. Boston then broke it open with Napoli's slam. Shane Victorino singled leading off and Pedroia reached on a fielder's choice. Second baseman Andy Parrino dropped a throw at second trying to get a force on the play. David Ortiz then walked before Napoli hit an 0-1 pitch into the first row of Monster seats into deep left-center. Jarrod Saltalamacchia added an RBI double off reliever Chris Resop, making it 9-3. With Ortiz returning the lineup three games ago, it makes for potent 3-4 punch. Napoli knows it can only help him later. The Athletics made it interesting in the eighth, scoring three runs off reliever Clayton Mortensen - two on a double by Josh Donaldson and the other on Josh Reddick's RBI double - before Junichi Tazawa escaped a two-on, one-out jam. Andrew Bailey worked the ninth for his fourth save. Oakland had moved ahead 2-0 in the second when Doubront's first wild pitch allowed a run. Reddick followed with an RBI single. Boston cut it to 2-1 in the bottom half on Napoli's RBI double. NOTES: The Red Sox honored the Watertown, Mass., police officers that were in a gunfight with the suspects of the Boston Marathon bombings late Thursday night. They were introduced and stood on top of Boston's dugout after the fourth inning. ... Red Sox CF Jacoby Ellsbury extended his hitting streak to 12 games. ... Oakland is 11-2 versus the AL West, but 1-6 against other teams. ... Napoli and Bailey were named the AL's co-players of the week. ... Farrell said before the game that closer Joel Hanrahan, on the 15-day DL with a strained right hamstring, ''threw the ball well'' in a 30-pitch bullpen. He's expected to have another one Wednesday. ... Boston RHP John Lackey, on the 15-day DL with a strained right biceps, began a rehab assignment by throwing 3 2-3 scoreless innings, allowing three hits with five strikeouts and two walks for Double-A Portland. ... Boston's Alfredo Aceves (1-0) is slated to face the A's Bartolo Colon (2-0) on Tuesday.